Centrally located in Michigan, Lansing is an affordable destination conveniently located within 90 minutes of 90 percent of the state's population. With 30 golf courses within a 30-mile radius, Greater Lansing boasts some of the best links in the country, with country club quality for public golf course prices. In the land of Sparty Golf is King! Nestled among the pines of the Manistee National Forest in Northern Michigan, you'll find a special, hidden gem, a place that offers golf and much more. Our golf rivals the best courses in the state with challenges for all abilities. Our 42 room Inn offers both standard rooms and a mixture of suites that are perfect for golf groups, family vacationers and business travelers. At the Medalist, you'll find a championship links-style 4.5 star course that has been exquisitely etched out of a landscape of almost 300 acres of rolling wooded land and wetlands. You're in South Central Michigan, but the terrain will carry you away in your mind to the state's northwoods. 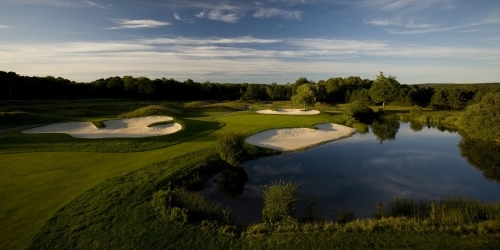 54 Holes of Award Winning World-Class Golf! Here's the perfect Michigan day.... wake up in your fairway side villa with beautiful view of Torch Lake before heading to Duffer's for their famous breakfast before heading to the first tee. It is hard to decide what course to play first, Sundance ranked 3rd in the country in 2006 for best new golf course or Torch, 4 star rated with some of the best views in all of Norther Michigan or Antrim Dells 10 miles north of Agaming with great views of lake Michigan to the west. Sundance is links style golf course with 118 bunkers but nice wide fairways and big greeens to putt on. A-Ga-Ming Golf Resort frequently hears that their greens are the nicest greens golfers have ever played so come out and experience for yourself at Agaming Golf Resort !!! Robinson design has matured into a layout that caters to all types of golfer. For tee times or packages call (855) 839-2272. 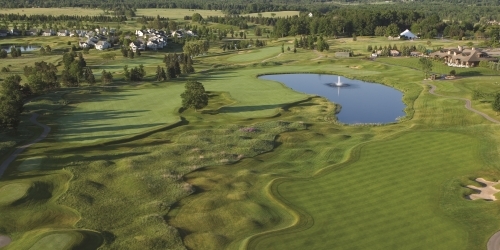 Exceptional golf courses complemented by the natural Northwoods beauty of Michigan's Lower Peninsula make Grand Traverse Resort and Spa a premier destination for golfers seeking a world-class experience. Grand Traverse Resort and Spa is renowned for many things, but the Michigan golf experience is among the best anywhere. For each of our three signature Michigan golf courses, we sought out the finest designers the industry has to offer. The Bear by Jack Nicklaus. The Wolverine by Gary Player. Spruce Run by William Newcomb. Which is probably why Golf Magazine awarded us their coveted Silver Medal and Golf Digest rated our courses among their best. Sweetgrass Golf Course located in the Upper Peninsula of Michigan has a variety of Michigan golf packages that includes staying at the adjacent Island Resort Casino. Sweetgrass GC offers a challenging, yet fair golf course that has received rave reviews by the participants of LPGA Futures Symetra Tour. Sweetgrass GC is also listed as one of the "Best Casino Courses" in the nation by Golfweek Magazine. 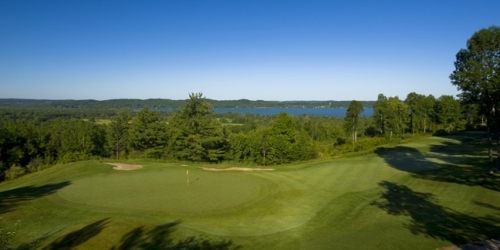 Our 18-hole Spruce Golf Course is one of the most beautiful and challenging courses in Michigan. Located on a hillside overlooking Lake Cadillac, the course winds through scenic pine forests and gentle hills. Its classic design, featuring rolling fairways and small greens with lots of slope from front to back, can be enjoyed by players of all experience levels. With 10 championship golf courses spanning 3 resorts - BOYNE Golf provides the ultimate world-class golf destination. Centered in Michigan's northern lower peninsula, our 153 holes are the products of some of the game's masters including Robert Trent Jones Sr. and Arthur Hills, along with a single course replicated from some of the finest holes ever designed by Donald Ross. Take it all in. Over 1,500 acres of green, rough, and bunkers as far as the eye can see. And once you get to that horizon, you'll see why we're called Treetops. We get that you're a little intimidated; that's understandable. You are in the presence of the 5 Wonders of Michigan, and there's no real way to get over it, but to get into it. You just might get a hole-in-one! Maybe. the ideal course for your next buddy trip or golf outing. Lakeview Hills is a glorious golf resort, with not one, but two courses. A mile from Lake Huron; spectacular views of one of Michigan's Great Lakes can be seen off several greens & tees, and were only 90 minutes from downtown Detroit. Whether a weekend getaway, golf outing, or fundraiser, Lakeview Hills and its many amenities are here to serve you. Lakeview Hills is perfectly suited for many events. With its serene surroundings; two majestic golf courses; a 16-lane bowling center; functional meeting facilities, private rooms, complemented by our catering services that can accommodate weddings, conferences, seminars, family & class reunions, social celebrations and holiday parties, you can be assured your guests will enjoy their stay. 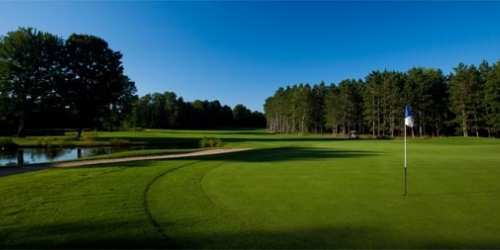 Crystal Mountain is northern Michigan's golf destination with two distinctively different, yet equally mesmerizing golf course. Both the Mountain Ridge and Betsie Valley golf courses have received a prestigious 4-Star rating from Golf Digest magazine and are sure to challenge your skills at every turn. 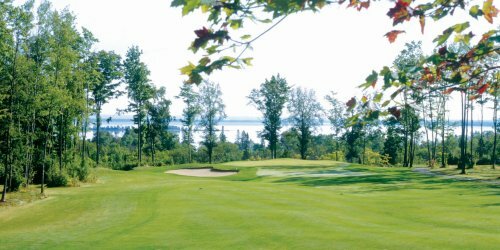 A short drive from Traverse City, both of Crystal Mountain's championship golf courses will beckon your play again and again. Located in Michigan's scenic Upper Peninsula just outside of Escanaba, Island Resort & Casino is one of the Midwest's largest golf, casino and entertainment resort destinations. The resort features 328 guest rooms including elegant suites and a 42 -site RV Park. choose from two world-class courses, each offering a distinct experience. breathtaking beauty of your surroundings. Bucks Run is located on 290 acres in Mount Pleasant, which is centrally located in the heart of Michigan allowing easy access from any location. Bucks Run provides golfers an experience not soon forgotten. This award winning Jerry Matthews layout is also home to the Quarry Grill and Banquet Hall, perfect for any event. The course features 1.5 miles of Chippewa River Frontage coming into play on seven holes. Natural wetlands and three lakes also come into play on numerous holes. The course provides players with amazing views from countless locations. Call (989) 773-6830 to schedule your tee time today! Named among the "Top Golf Resorts in the World" and ranked highest among all Michigan golf resorts in Conde Nast Traveler (April, 2012), Shanty Creek offers four championship golf courses, each a unique experience with a distinctive combination of challenges and natural beauty. A unique and unforgettable golf vacation await at Shanty Creek Resorts!